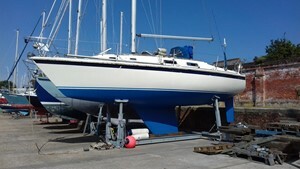 Volvo Penta engine (13.43 kW), new batteries 2015, 13 amp ring main, built-in battery charger from shore supply unit; sails include slab reefed cruising main and fully battened racing main, furling headsail, spinnaker, cruising chute; GRP superstructure, standing rigging renewed 2006/07, new windows throughout, interior fully reupholstered, headlinings renewed, 2-burner cooker with grill and oven, coolbox, crockery, cutlery and glassware included, inline water filter; equipment includes Stowe wind, depth and log system, autohelm, VHF radio connected to GPS, Navtex receiver; 4 man rubber dinghy, life jackets, life belts, throwing line, spare kedge anchor. Please contact for more details and photos. Currently in Hornet Marina, Haslar. Well worth viewing.